Getting the most from a fleet is the primary concern for any fleet manager. Knowing where vehicles are is only the beginning. FleetMaster provides operators with activity timelines to illustrate utilisation patterns in their fleets. This assists in boosting efficiency. For fleet operators today, it’s crucial to not only track your vehicles, but to have immediate access to secure information about your drivers and vehicles at all times. FleetMaster Systems by Master System Technologies is an end-to-end solution designed to give fleet operators the tools they need to sustain a high-performing operation – one that’s operating at optimum levels of efficiency and safety. FleetMaster (FM) Systems comprises an on-board computer, an online tracking and information portal as well as access to valuable fleet and driver reports and analytics. In addition, 24/7/365 customer support is provided throughout the partnership MasterSystem Technologies has with its customers. FleetMaster Systems includes mobile applications that allow fleet managers to remain connected to their fleet at all times. A MasterSystem Technologies (MST) on-board computer collects and transmits fleet data including vehicle location, driver identity, driving events, fuel usage as well as distances travelled. Fleet managers then access this information – and obtain key insights about the data – through FleetMaster System’s online tracking and information portal. The solution’s global service delivery platform is underpinned by a world-class security model. FM provides secure 24-hour access to fleet data, while advanced reporting and analytics tools enable informed decisions to be taken for the overall improvement of a fleet’s performance. Data, reports and trends can be generated using satellite feedbacks from Mix Telematics. Fleet information can be conveniently exported or sent as notifications via email, or even text messages, on a regular basis. 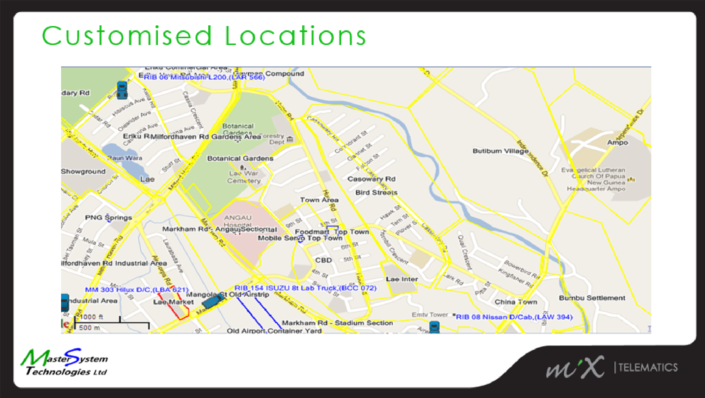 MiX Telematics’ purpose-designed mobile applications enable fleet managers on the move to keep tabs on their vehicles, drivers and other mobile assets while they are out and about. The apps support various languages, and are available for iPad and a range of smartphones. MIXED FLEET WITH MIXED NEEDS? Many fleet managers with mixed fleets need peace of mind without using multiple systems and services. FM provides the right on-board computer for all vehicle types, including heavy goods vehicles, light good vehicles, OBDII-equipped light goods and passenger vehicles, motorcycles and trailers. Regardless of which on-board computer they have fitted, fleet managers are assured of the same superior level of support across their fleets. A highly configurable video recording system that integrates with FleetMaster, MiX Vision simultaneously captures video footage of the driver and his view of the road. The video solution includes a tamper-resistant camera unit that is attached to the inside of the vehicle’s windscreen. When an event occurs, the system triggers the automatic upload of two 15-second low resolution video clips, one showing the driver and one showing the road. 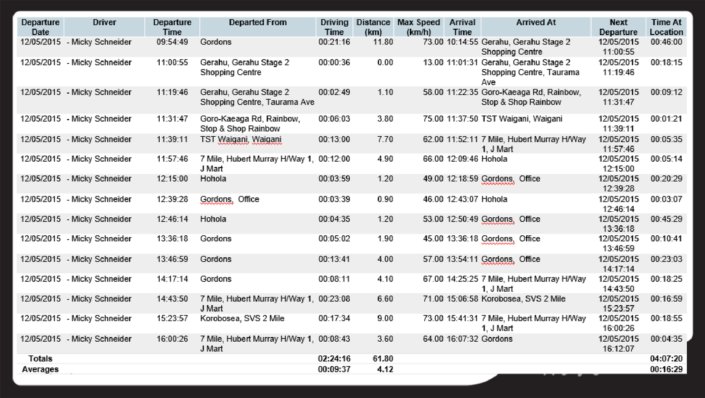 The integration of video brings telematics data to life. 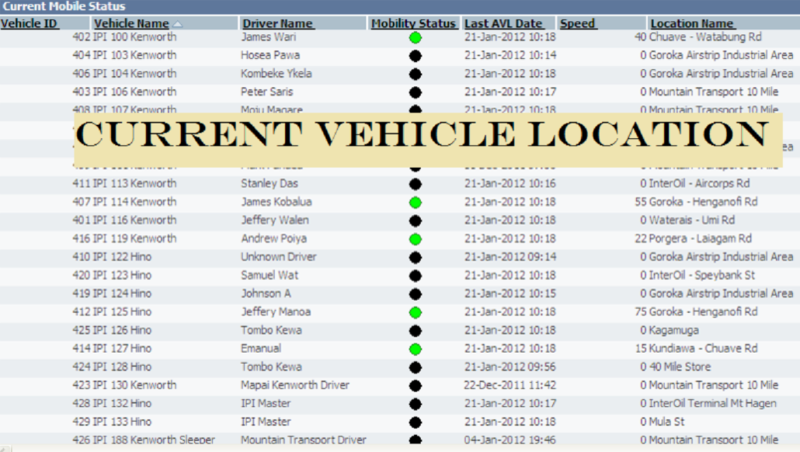 FleetMaster Systems affords customers access to vehicle and driver information anywhere, anytime. As a result, there are a host of benefits, all translating into increased profitability over time. MST provides a range of reports to enable the monitoring of fuel consumption. However, the key to reducing fuel and maintenance costs is to improve driver behaviour. Vehicles that are driven well perform more efficiently and require less maintenance. 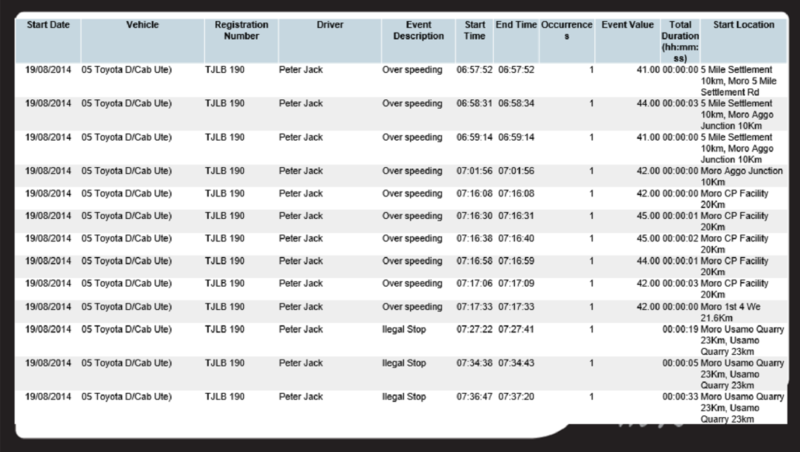 FM provides customers with all the tools necessary to monitor, manage and improve driver behaviour. These include the MiX Rovi and RIBAS in-cab displays as well as a range of scoring and error reports. 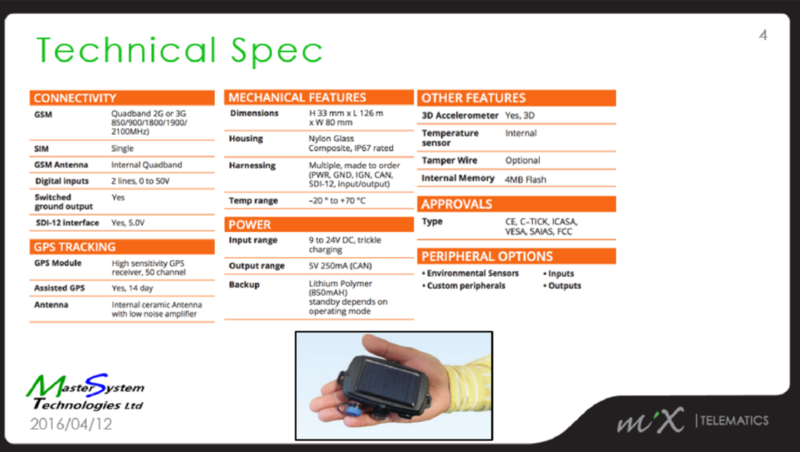 This combination is highly effective for safety improvement and risk reduction. 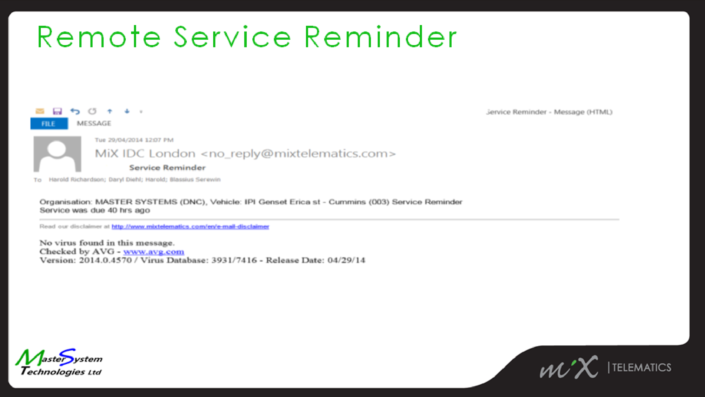 Servicing and licencing schedules can be managed efficiently through automated reminders. Reminders can be configured to trigger when the set distance, duration or engine hours have been reached. Getting the most from a fleet is the primary concern for any fleet manager. Knowing where vehicles are is only the beginning. 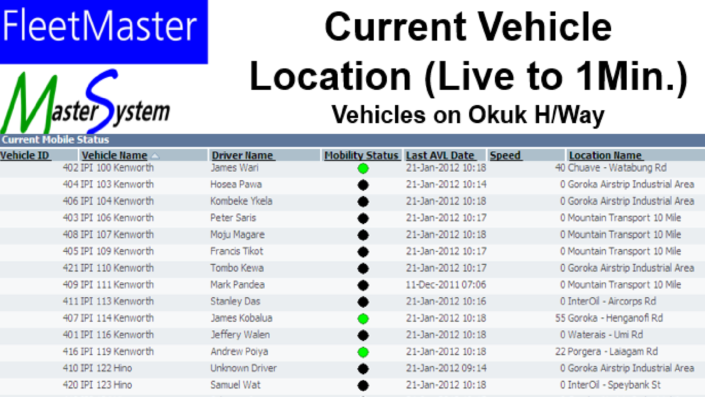 FM provides operators with activity timelines to illustrate utilisation patterns in their fleets. This assists in boosting efficiency. FM includes a find-nearest-vehicle function. 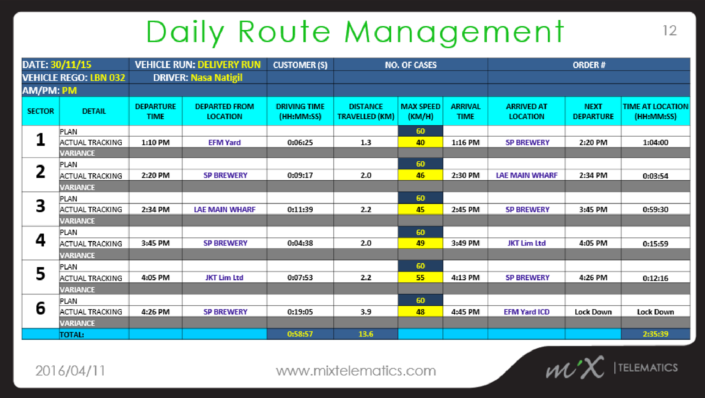 It allows a fleet manager to identify the closest vehicle to a customer, send the driver a job and seamlessly route him straight there using the MiX Rovi in-cab navigation and messaging device.